Rainbow Bridge | Sugar Dogs International, Inc. Recently, we have lost several wonderful Sugar Dogs to some dreadful circumstances and several beautiful working dogs to old age. Anya and Johnny Cash will always miss you sweet June Carter. Sweet Sugar Dog Mozart passed on to the Rainbow Bridge in his sleep. He was 18 years old and still working for his Mom Pat. 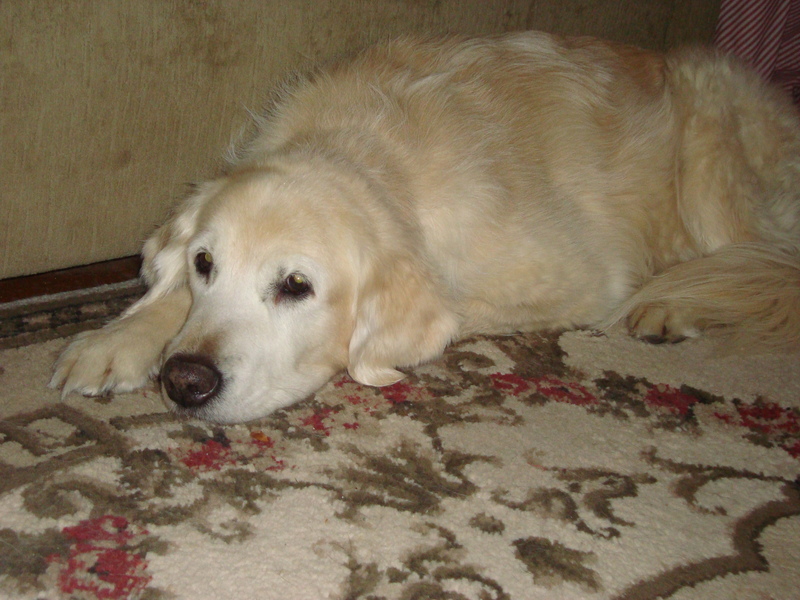 Our dear Francesca in Toronto had to have Sunny, her Golden Retriever, put to sleep due to serious illness. She was 15 years and 4 months of age. After a short walk at noon on Wednesday, Sunny came home and plopped down with all 4 legs splayed. Francesca thought her legs were tired and by morning she’d be able to get up again but her legs had just completely given out. Her last night was very hard for her and Francesca called the vet the moment he opened at the stroke of 8:00 a.m. He came to the house and arrived by 9:30. Daisy, Francesca’s other dog was heart-broken…you never saw such sad eyes!! After it was all over, Daisy and Francesca were cuddling in the bed and the 2 cats came and jumped in and they had a family grieving session. It was sad but also quite beautiful and uplifting to see the other members of her pack mourning together. “Sugar Boy was in love with Sunny. Sunny was truly a magnificent and highly evolved being. She was truly “the world’s most gentle dog”. She lavished her love on everyone she met, human and other species as well; and every creature (human or other) who met her loved her. In every neighbourhood we have ever lived, Sunny was always the best known and most popular resident. Most people assumed that Sunny was seeking attention from everyone she met; but I know differently. She was actually offering her overflowing, abundant love and compassion to everyone she encountered. I believe this was her purpose in life and I know that she taught me unconditional love and assisted in my personal spiritual awakening. Our condolences don’t seem good enough for wonderful Sugar Dogs like Sunny. 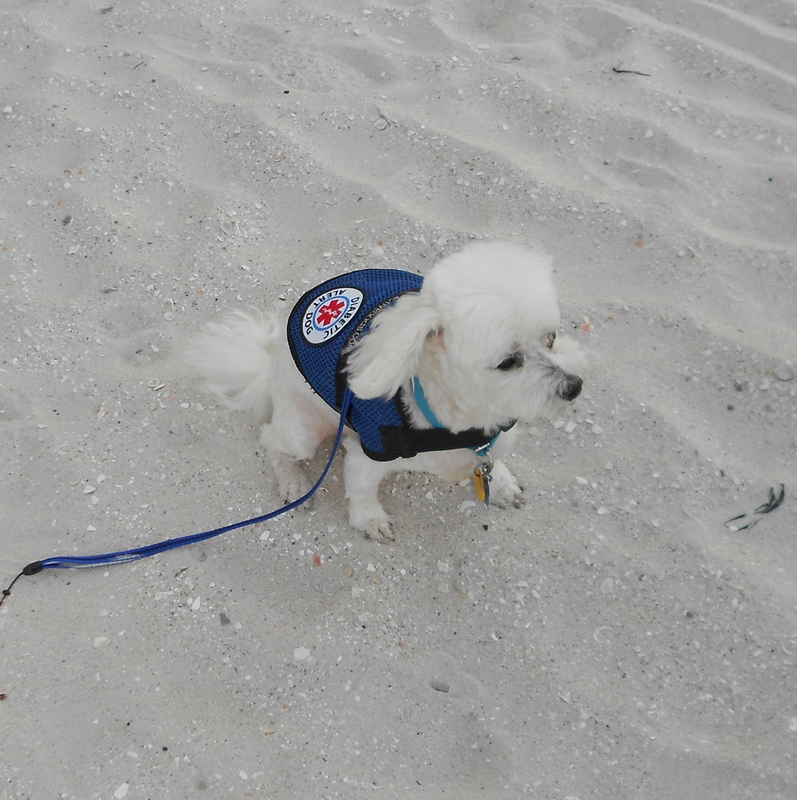 Peppie was attacked by two (2) Pit Bulls in Pasco County, FL and the young man walking him was bitten as he tried to save the service dog. Neither the local Sheriff’s Office nor the local Animal Services responded appropriately. The murdering dogs were not apprehended and the young man had to suffer Rabies injections in his stomach. Sugar Dogs International came to Mark’s aid and provided documentation for the very successful court case that followed the service dog’s untimely death. June died at the emergency veterinarian’s office in Louisville, KY from possible veterinary malpractice. She was 17 months old and alerted for her diabetic spontaneously. She was a lovely lady, always well behaved. In the past we’ve lost Sugar Dogs to being left in a car for 5 minutes with the windows up, heartworms, heart attacks, breast cancer, snake bites, car accidents, and one poor animal simply disappeared one rainy night. Sugar Dogs are also at high risk of being stolen. Please do not post your address. While all of us want to do the very best that we can for our animals, we are their advocates and their only voice. Please speak up for Sugar Dogs, speak out for Sugar Dogs, find a new Sugar Dog and love again. To a poor and lonely stray, I’d give my happy home, my bowl and cozy bed, soft pillows and all my toys. I’d give the lap I loved so much, the hand that stroked my fur, and the sweet voice that spoke my name. I’d will to that sad, scared shelter dog, the place I had in my human’s loving heart, which seemed to have no bounds. So when I die, please do not say, “I will never have another dog, for the loss and pain is more than I can stand.” Instead, please go find an unloved dog, one whose life has held no joy or hope, and GIVE MY PLACE TO HIM OR HER. For you see, this is the only thing I can really give… The love I left behind. If you are like most pet lovers, you think of your pets as family members. One of the issues we face in rescue is pets whose owners become unable to care for them. Health issues, owners unexpectedly having to go into a rehab facility or nursing home or the unfortunate death of the owner are only some of the things that leave pets without a home. If pet owners would provide a Pet Trust for the care of their beloved pet, there would likely be more friends and/or family members willing to take on the care of the pet and fewer pets in shelters and rescues. However, if a pet did end up in rescue and there was a trust for the pet–it would certainly be welcome financial assistance for the pet’s care. Some pets stay with rescues for only a week or two. Others are there for months and sometimes for a year or more, while others are never adopted. This long-term care is very costly for rescue groups. A Pet Trust is a legal arrangement made for the care of one or more pets in the event of their owner’s disability or death. The trust can take effect while the owner is living and/or after their death. Generally, there will be a person designated to hold the funds in the trust and that person will make payments to a designated caregiver monthly or whatever is designated in the trust. In some states, the trust may continue for the rest of the animal’s life. The American Society for the Prevention of Cruelty to Animals recommends that since there are several states in which a pet trust is not valid, and other states where enforcement is discretionary, it is advisable to set up a trust with the help of an attorney who specializes in estate planning. * Describe your pet’s standard of living and care in detail. That is, their nutritional needs, any health problems they have and the kind of home they are accustomed to living in. * Require that the trustee ensures the caregiver is providing the pet with regular, thorough veterinary check-ups (i.e. twice annually). * Determine the amount of cash or assets needed to adequately cover the expenses for your pet’s care. Generally, this amount cannot exceed what may reasonably be required given your pet’s standard of living. You should also specify how the funds should be distributed to the caregiver. * Determine the amount of cash or assets needed to adequately cover the expenses of administering the pet trust. This would cover fees accrued by the trustee and possible attorney consultations, for example. * Choose a beneficiary who will receive any remaining funds that were not used by the pet trust. * Provide directions for your pet’s burial or cremation.